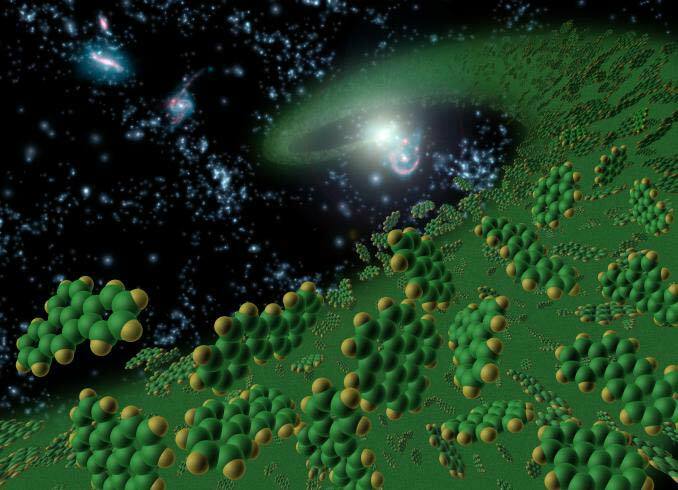 Did the Largest Known Molecules in Space Seed Life on Earth & Elsewhere? NASA Astronomers discovered an abundance of buckyballs -the largest known molecules in space, using the Spitzer Space Telescope to find the carbon spheres in the space between stars and around three dying stars. The Spitzer also detected buckyballs around a fourth dying star in a nearby galaxy in huge, unexpected quantities — the equivalent in mass to about 15 of our moons. A study of R Coronae Borealis stars by David L. Lambert, Director of The University of Texas at Austin’s McDonald Observatory, and colleagues showed that buckyballs are more common in space than previously thought. The miniature spheres were first discovered in a lab on Earth 25 years ago, but it wasn't until this past July that Spitzer was able to provide the first confirmed proof of their existence in space. At that time, scientists weren't sure if they had been lucky to find a rare supply, or if perhaps the cosmic balls were pervasive. "It turns out that buckyballs are much more common and abundant in the universe than initially thought," said astronomer Letizia Stanghellini of the National Optical Astronomy Observatory in Tucson, Ariz. "Spitzer had recently found them in one specific location, but now we see them in other environments. This has implications for the chemistry of life. It's possible that buckyballs from outer space provided seeds for life on Earth." New research will appear in the March 10 issue of The Astrophysical Journal. Lambert's team found that “buckyballs do not occur in very rare hydrogen-poor environments as previously thought, but in commonly found hydrogen-rich environments and, therefore, are more common in space than previously believed,” Lambert says. Buckyballs are made of 60 carbon atoms arranged in shape similar to a soccer ball, with patterns of alternating hexagons and pentagons. Their structure is reminiscent of R. Buckminster Fuller’s geodesic domes, for which they are named. These molecules are very stable and difficult to destroy. The consensus based on lab experiments has been that buckyballs do not form in space environments that have hydrogen, because the hydrogen would inhibit their formation. Instead, the idea has been that stars with very little hydrogen but rich in carbon — such as the so-called “R Coronae Borealis stars” — provide an ideal environment for their formation in space. Lambert, along with N. Kameswara Rao of Indian Institute of Astrophysics and Domingo Anibal García-Hernández of the Instituto de Astrofisica de Canarias, put these theories to the test. They used Spitzer Space Telescope to take infrared spectra of R Coronae Borealis stars to look for buckyballs in their chemical make-up. They found these molecules do not occur in those R Coronae Borealis stars with little or no hydrogen, an observation contrary to expectation. The group also found that buckyballs do exist in the two R Coronae Borealis stars in their sample that contain a fair amount of hydrogen. Studies published last year, including one by García-Hernández, showed that buckyballs were present in planetary nebulae rich in hydrogen. Together, these results tell us that fullerenes are much more abundant than previously believed, because they are formed in normal and common “hydrogen-rich” and not rare “hydrogen-poor” environments. In an earlier 2010 study, Anibal García-Hernández and her team found the buckyballs around three dying sun-like stars, called planetary nebulae, in our own Milky Way galaxy. These cloudy objects, made up of material shed from the dying stars, are similar to the one where Spitzer found the first evidence for their existence. Their new research shows that all the planetary nebulae in which buckyballs have been detected are rich in hydrogen. This goes against what researchers thought for decades — they had assumed that, as is the case with making buckyballs in the lab, hydrogen could not be present. The hydrogen, they theorized, would contaminate the carbon, causing it to form chains and other structures rather than the spheres, which contain no hydrogen at all. "We now know that fullerenes and hydrogen coexist in planetary nebulae, which is really important for telling us how they form in space," said García-Hernández. García-Hernández and his colleagues also located buckyballs in a planetary nebula within a nearby galaxy called the Small Magellanic Cloud. This was particularly exciting to the researchers, because, in contrast to the planetary nebulae in the Milky Way, the distance to this galaxy is known. Knowing the distance to the source of the buckyballs meant that the astronomers could calculate their quantity — twenty percent of Earth's mass, or the mass of 15 of our moons. The other new study demonstrated that buckyballs are also present in the space between stars, but not too far away from young solar systems. The cosmic balls may have been formed in a planetary nebula, or perhaps between stars. "It's exciting to find buckyballs in between stars that are still forming their solar systems, just a comet's throw away," said Kris Sellgren of Ohio State University. "This could be the link between fullerenes in space and fullerenes in meteorites." The implications are far-reaching. Scientists have speculated in the past that buckyballs, which can act like cages for other molecules and atoms, might have carried substances to Earth that kick-started life. Evidence for this theory comes from the fact that buckyballs have been found in meteorites carrying extraterrestrial gases. "Buckyballs are sort of like diamonds with holes in the middle," said Stanghellini. "They are incredibly stable molecules that are hard to destroy, and they could carry other interesting molecules inside them. We hope to learn more about the important role they likely play in the death and birth of stars and planets, and maybe even life itself." The little carbon balls are important in technology research too. They have potential applications in superconducting materials, optical devices, medicines, water purification, armor and more.